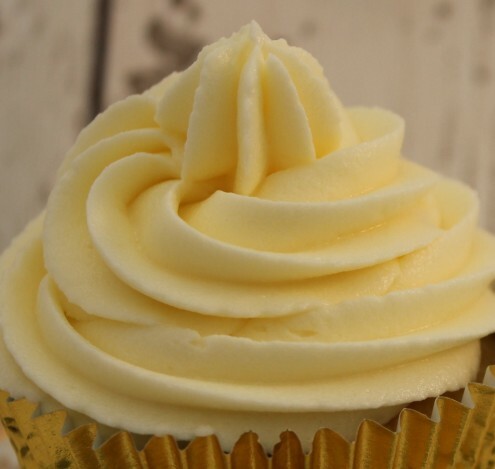 Classic rather than basic, this Vanilla Buttercream should be your go-to for all of your buttercreaming requirements! It works on cakes and cupcakes, spread haphazardly or piped in elaborate swirls. It should hold its shape nicely and cope with ambient room temperatures. Don’t leave it out in the sun but always spread and serve at room temperature for the most fluffy texture. As ever, I am going to bang on about the benefits of using really good quality vanilla extract. You get what you pay for and you will taste the benefit here. Beat the butter until creamy and pale. This is far easier done in a freestanding mixer with a nice powerful motor! You can make this using an electric handwhisk but I really recommend using some kind of mechanical assistance. Add 250g of your icing sugar and beat util combined. Hold a tea towel over the top of your stand mixer to prevent an inevitable shower of icing sugar. Add the vanilla extract and check the consistency of your buttercream. If it feels too runny, add more icing sugar. If it is the consistency of a spreadable butter, you are nearly there. Once you are happy with the consistency of the buttercream, beat it into a most heavenly submission. Give it around 3-5 minutes on a medium speed until it is really pale and light. This extra beating time results in a consistency that is more like a beaten double cream.